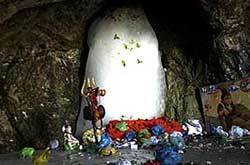 Srinagar ( Kashmir) May 1 - To ensure better forecasting of weather situation for the smooth conduct of Shri Amarnathji Yatra 2012, several initiatives are being taken. This was disclosed in a meeting at Raj Bhavan, Srinagar held under the Chairmanship of the Principal Secretary to the Governor and Chief Executive Officer, Shri Amarnathji Shrine Board (SASB). Among others Head of the Meteorological Department participated in the meeting. It was disclosed that the Meteorological Department is in the process of establishing three Advanced Warning Systems (AWS) each at the Base Camps at Baltal and Pahalgam as well as at the Holy Cave. This will provide better and more accurate prediction of likely weather on a given date along Shri Amarnathji Yatra track. The Meteorological Department has also decided to install weather display board at the Nunwan Base Camp as well as at Baltal Base Camp for the benefit of pilgrioms. It was also decided that the Meteorological Department will provide instant warning regarding any weather related disturbances to all authorities concerned through SMS Service. Head of the Meteorological Department informed that the Department is in the process of establishing Doppler Radar at Srinagar for which the procurement process is at an advanced stage. Once established, this will provide a huge facility for more accurate weather prediction in the Kashmir Valley. 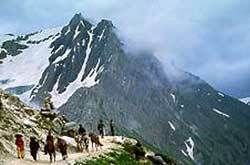 This will benefit not only Shri Amarnathji Yatra but to the general masses in Kashmir Valley throughout the year. In the meanwhile pilgrims can access information on weather Forecast in Kashmir through this website as well. Shri Amarnathji Yatra by New Helicopter Service provider. On-line booking from 31st May, 2012.